America’s Pastime – Stahl-Meyer Foods, Inc. 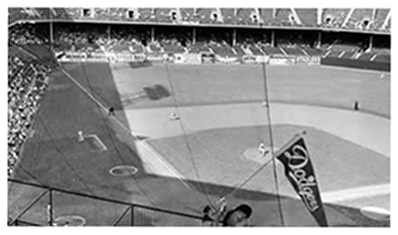 In the 1950’s, Ferris, Stahl-Meyer supplied all of the major league baseball parks in the New York City area with their 100% All-Beef Frankfurter. Whether you were a fan of the Yankees, Giants, or Brooklyn Dodgers, you were most likely enjoying a famous Stahl-Meyer Frankfurter while watching a game. Also during the 1950’s, a series of baseball card sets were distributed and sponsored by different food companies in the area. One of the rarest regional baseball cards sets to come occurred in 1953 and was issued by Stahl-Meyer, Inc. These baseball cards were only available within a packet of Stahl-Meyer 100% All-Beef Frankfurter. On each of the baseball cards were a famous baseball star and their statistics. On the back of each baseball card was a raffle to win FREE tickets to any of the three stadiums. All customers had to do was send Stahl-Meyer, Inc. a letter of 25 words or less explaining why they liked Stahl-Meyer Hot Dogs. The baseball card sets included Mickey Mantle, Phil Rizzuto, and Hank Bauer of the New York Yankees, Roy Campenella, Gil Hodges, Monte Irvin, Duke Snider, Carl Erskinen, and Don “Duke” Newcombe of the Brooklyn Dodgers, and Willie Mays and Bobby Thompson of the New York Giants. Today, these baseball card sets are very valuable and considered one of the rarest sets to come out during the 1950’s. 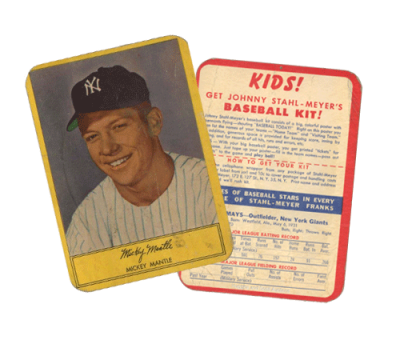 Leland declares the 1954 Stahl-Meyer Mickey Mantle cards “one of the rarest Mickey Mantle Cards in the hobby” Aaron Wasser describes the entire Stahl-Meyer set as “excruciatingly rare” in a 2014 article for Sports Collectors Daily. Stahl-Meyer banks on air media through television and radio. In 1958 Stahl-Meyer focused on advertising towards the youth of America through Television and Radio. The campaigns would consist of give-a-ways geared towards children, as they believed “a contest is the most valuable emotional tool for children” who could sign up by sending in the stations a contest card, where over 20,000 cards were sent in from the New York area. Stahl-Meyer is the first to market the new sized, one-and-a-half pound canned ham as the rest of the industry quickly followed. Later in the year, Stahl-Meyer was the first to put franks in glass jars and tins. Family Barbeques Hot Dog Competitions were family rituals throughout the 1960s and the competition was exciting. Families would select the brands of Hot Dogs they wanted to cook and often, Stahl-Meyer was in the mix, labeled as the famous Hot Dog of the New York Yankees, giving family members the remberance of having a hot dog at one of the Yankee, Dodger, or Giant games in New York City.